Over 230 students walked across the stage to get their degree at Drury University’s graduation. 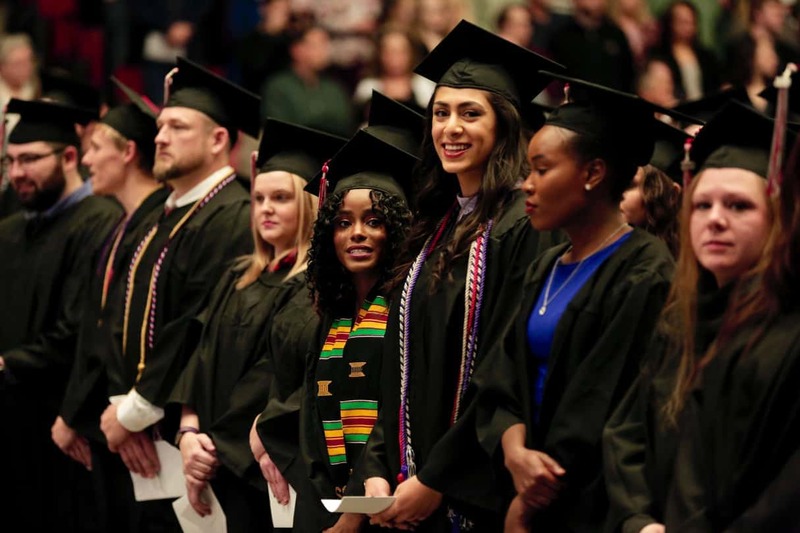 There were 216 undergraduate degrees and 15 graduate degrees awarded at the ceremony on Saturday. SPRINGFIELD, Mo., Dec. 15, 2018 — Drury University awarded degrees to 231 graduates at today’s winter commencement. There were 216 undergraduate degrees conferred by both the traditional Day School and the College of Continuing Professional Studies; 15 graduate degrees were conferred by the Graduate College. The Rev. Chris Dorsey addressed the new graduates. Dorsey serves as president of Higher Education & Leadership Ministries for the Christian Church (Disciples of Christ). Drury’s relationship with the Disciples of Christ began a century ago with the establishment of the Drury School of Religion in 1909. As the director of admission for 17 years, Thomas and his team guided more than 10,000 new students toward their own personal Drury experience. After he was appointed Drury’s first dean of international studies in 2002, Thomas launched opportunities for foreign study that added a new dimension to the student experience. Under his leadership, a Drury campus was established in Greece and many partnerships and student exchange programs were formalized within other countries. Thomas retired in 2015.